Steve Bacon is our music leader. To contact Steve, email us or call the church at 651-437-9855. 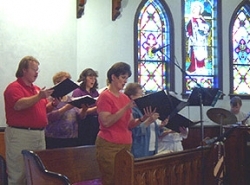 Choir leads the hymns and provides special music at the 10:00 a.m. service. New choir members are always welcome. Wed. 7:00 - 8:00 pm & Sundays at 9:00am. Parish musicians play for our contemporary services and all instrumentalists are welcome. Contact us for more information.